This is Lynn’s Catawampus Quilt and the pattern is by Freckled Whimsy, you can find it here. 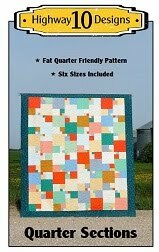 The fabric line she used is called Felicity by Cynthia Coulter. She asked for custom quilting so I quilted a free hand feather motif in the white areas and since the square of print fabric were all different sizes I just highlighted the diagonal design by added three lines. Quilting diagonal lines on a longarm is a bit of a pain but so worth it on this quilt! The ice is finally 4 inches thick so safe to walk on by the shore. I had my son out there with me just in case! I wanted to share a tip with you about how I marked the feather motif without really marking it! There is a great tool called the Clover Hera Marker and what it does is just leave a indent in the fabric, no ink! Here is the tool and the ruler I used. I marked two diagonal lines first to find the center and to use as a guide to keep my feathers contained in that quarter section. Then I did two more lines, horizontal and vertical, to use as my center guide for my feathers. So I now have lines to use as a guide with no worries of having to remove later! Love this tool. I then free hand quilted the feathers making sure I did the same number of plumes in each section so they balanced. You can see the colour of the fabrics so much nicer in the indoor pictures! This is my last custom quilt before my December break. I have two more quilts to finished and then I can work on my own projects! This is Robin’s Zentangled Garden quilt and the pattern is by Jean Boyd. I love the fabric that Robin used in the framed sections and since it was so bold I quilted it with straight lines. I used two stencil designs in the dark green squares. The background is all larger scale pebbles and on the open ‘negative space’ area to the right I added a echo swirl design to break up the space. I then did a diagonal piano key design in the outer border and on the one side that had the extra green border insert I just continued the diagonal line across it. I used black So Fine thread in the outer border and light green So Fine thread on the rest of the quilt. Batting is a Hobb 80/20. The other night Tim and I covered one of our spruce trees near the lake with white lights. The light reflects off the snow in the tree and glows in our yard! 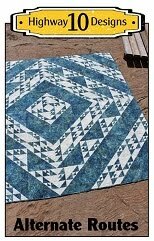 This is Alene’s Winter Blessing quilt and it is a pattern by Primitive Gatherings. I have quilted this one before and used many of the same elements. This is a cute wool applique quilt and Alene did beautiful hand applique. I stitched in the ditch around all the applique and around all of the wool details. Feather curls in the outer border and simple curls in the inner border. Batting is Quilters Dream Blend and I used beige So Fine and Navy So Fine on top. I was nice to see the sun this morning after a week of snow. There were sparkling sundogs in the sky and it was nice to be able to use the ice to display my quilts again. I can’t wander to far from the dock, like more than a few steps, as the ice is still very thin from all the snow. You can see the depression in the snow in the center of this next picture, that is from the slush under the ice so not going near there! This picture was taken right beside the dock. This is Megan’s Deck-ade the Halls quilt which was a Jolly Jabber Quilt Along in 2013 and it looks like the pattern is still available for free here. 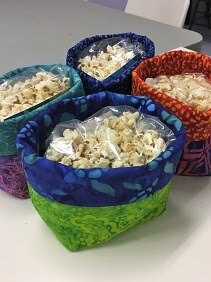 This is an adorable pattern using the Aspen Frost fabric collection. Megan asked for denser custom quilting so we decided on the pebbles with the odd swirl for the background. 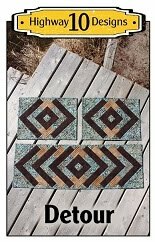 Since the border fabric as a distinct pattern we went with a bead-board design in the outer border. I stitched in the ditch around all the images and added details like feathers in the wreaths and stockings. The batting is Quilters Dream Blend and the thread is white So Fine on the top and white Bottom Line on the back. As you can see winter is here, it arrived quite quickly and with vengeance as we went so long this fall without snow. The lake is trying to form ice but the wind has prevented that from happening. Now that it has calming down I expect the lake to be frozen over tomorrow morning. I measured 10 inches with handy dandy snow measuring tool, but it was so windy it drifted and some areas are knee deep, I’m sure we had more than that fall. This is Raye’s Just Can’t Cut It quilt and it is a design by All Washed Up. This is a gift for her grandson that loves baseball so this was a great pattern to highlight the baseball themed fabric. The panto is Fascination, the batting is Quilters Dream Puff and the backing is a grey Minkie. I’m happy to add that the paper version of our City Slicker pattern is now available on our Etsy site here. Oh you might have noticed some ‘white stuff’ in that picture, my wish came true! Woke up to this beautiful sight and it is suppose to snow all day! 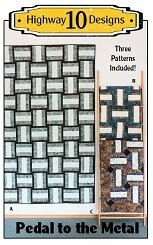 This is Phyl’s Three-Six-Nine quilt which is a pattern by Karen Montgomery of The Quilt Co. The fabric collections is called Lady Slipper Lodge by Moda and the colours are so warm. Since the prints have a dainty flowers designs we decided to use Wildflower for the pantograph. The thread is a medium green So Fine with a beige Bottom Line for the back. Batting is Quilters Dream Blend and backing is one of the wide Stonehenge backings that I carry. This is a large queen sized quilt, 90” x108” so covers a Queen size bed nicely. 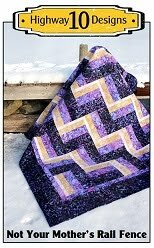 This is Megan’s In From the Cold quilt and you can find this Kate Spain pattern free on the United Notions website here. It is a very cute quilt made with steaming cups of your favourite hot beverage for winter. Megan asked for light custom quilting so I let the name of the quilt and fabrics dictate the designs. I quilted snowflakes in the sashing and swirls of steam rising from the mugs. I stitched in the ditch around all the mugs and added some details in each mug. I also added a simple meander in the outer border as I didn’t want the quilting to compete with the cute mitten fabric. I used white So Fine thread on top and white Bottom Line on the back. The batting is a Hobbs blend. I was hoping to have snow by now but no luck. Now that it’s getting cold I'm ready for winter and honestly looking forward to the white stuff! Second International Round Robins Revealed!